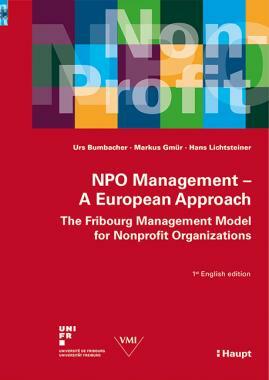 The Fribourg Management Model for NPOs (FMM) is a standard reference work for the management of associations and other private Nonprofit Organizations. It is the result of 40 years of theoretical and empirical research at the Institute for Research on Management of Associations, Foundations and Cooperatives (VMI) of the University of Fribourg/Switzerland. It is based on the extensive experience of a group of leading academics in education and consultancy work and is designed for practitioners in the Nonprofit Sector in German-speaking Europe (Switzerland, Germany and Austria). Given its unique and pioneering approach, the model has been well received by its target groups and has already been published in its eighth German edition. This success has therefore called for an English translation. For this first English edition, the terminology has been adapted to better suit an English speaking audience, while staying as true to the original as possible. Furthermore, the original cases and practical examples from the German version were partly replaced by more generic examples. Given these adaptations, we hope this English version will be as well received as its original German.